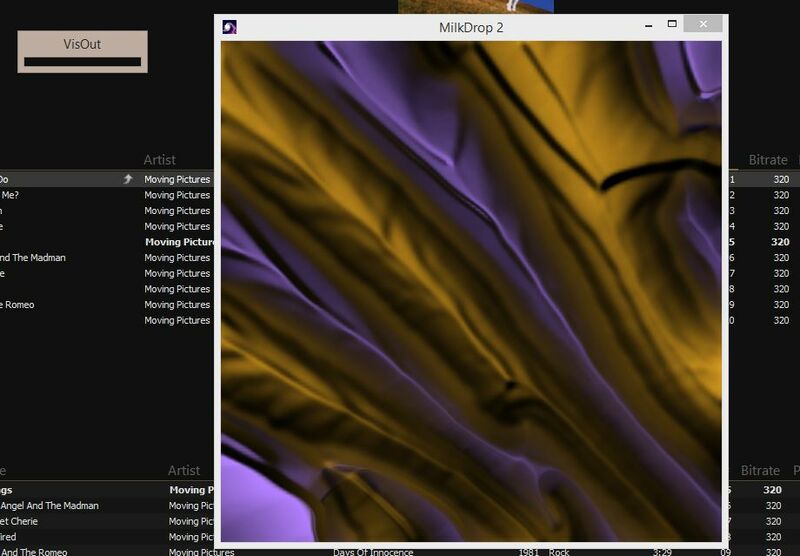 Recently switched to MM from Winamp and was missing the old Milkdrop2 visualizations. Since the code was open-sourced last year I took a look and fixed the incompatibility issues. It is now running on my machine and I have built an mmip file with Geiss's favorite presets package included. I haven't tested this on any other machines so let me know if you are having problems. Last edited by mstrange on Sat Nov 08, 2014 2:42 am, edited 1 time in total. Have installed as current user. Everything seems to be in the right place and kosher, but unfortunately the plugin isn't showing up in Options - so I can't access it to configure or test. Any suggestions? Rename the MMIP file to a ZIP file and extract it. Then restart MM and see if the plugin is showing up in the list. 4. If none of that works let me know and I can send you a debug build that will log the error to a file. Yep, already been through all of that - but no dice, it still doesn't show. I'll fiddle around a little more and let you know. I'm not big into visualizations, but I thought I would give it a try. The installer worked fine for me. How do I change the visualization? And how do I start and stop it when playing music? Sorry if the question is dumb. I don't usually use visualizations. OK. I have found where to start visualizations. Under the "View" menu. Something that I noticed is that Esc wouldn't let me out of fullscreen mode, but Alt+Enter does. Meander wrote: Yep, already been through all of that - but no dice, it still doesn't show. I'll fiddle around a little more and let you know. I'll PM you with a debug build tomorrow, I don't think the plugin does much more than minor winamp RPC calls before it shows up in the menu there; without my edits it would normally crash in this part due to an unimplemented call. But off the top of my head I can't see why this is happening so I will need to look into it a bit. Stigg wrote: I'm not big into visualizations, but I thought I would give it a try. Yeah, the View menu is the right way to start it. Alt-Enter will toggle between fullscreen. The "Desktop" mode has been disabled in code, Geiss says it doesn't work with the versions of Windows the came after XP. The way to cycle through the different visualizations is to hit the H key (for Hard Cut). It defaults to switch every few seconds but you can change that in the Configuration. It will show you a full list of command buttons in the window if you hit F1. I'm not sure what you mean by VisOut? I don't see that referenced in the code anywhere, are you seeing error messages in the visualization window? After leaving Fullscreen mode, I get a VisOut window. Not really a window. See pics below. Stigg wrote: After leaving Fullscreen mode, I get a VisOut window. Not really a window. See pics below. Aha, thank you, that's a bug. This is a subprocess called VisHelper.exe that MediaMonkey runs all the visualizations in. I had not noticed the phantom window there when you switch away from fullscreen, I'll take a look and see if I can eliminate it. For the time being, the Configuration window will start it in the mode of your choice so you don't have to toggle. Any assistance or insight would be greatly appreciated! *edit: forgot to give the basics! Running MM v4.1.5.1719 on Windows 7 Ultimate (x64) in a VMWare virtual machine. I sent Meander a debug binary that would drop debug output in the plugin loading phase and it looked none of the loading code was ever run at all by MM. So the issue seems to be with MM not seeing or not loading the visualization DLL. The first thing I would try is to do a new MM install selecting the portable option, so it installs everything to a new location that is not affected by any operating system environment variables like c:\mediamonkey. 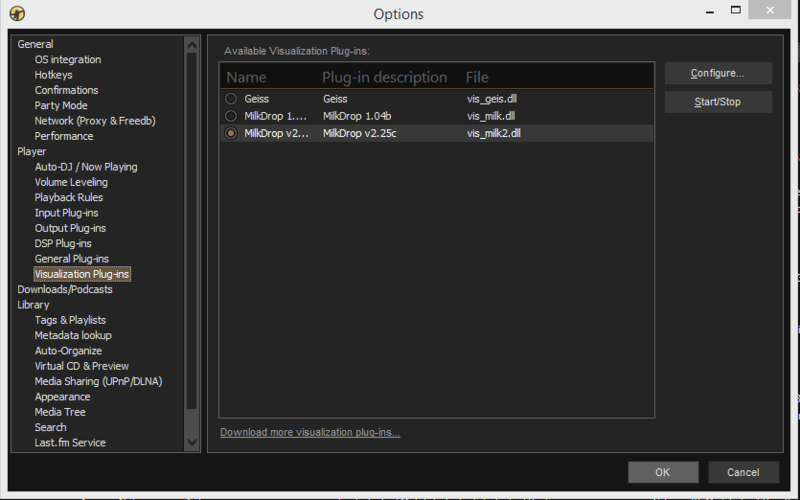 Let me know if can you install any other Visualization plugins successfully, this should be a cross-platform 32-bit DLL but perhaps there is some other machine-specific dependency I'm not noticing. I forgot to mention that I downloaded Twisted Pixel 2.0, from the addons page, to test the environment. It comes as an exe, but I extracted it to replicate manual install of your plugin. MM sees TP2 dll and it runs with no problems (Configuration is out on this one, though, as it causes MM to close outright!). Thx Meander, I did some comparisons between the twisted pixel DLL and my milkdrop dll. If either of those does it for you, let me know. THX for port MAtt, If you need to get more infor from MMW like Album art I'll be glad to help you archive that as as of MMW 4.1 you can access MMW easily from DLL directly without initiating ActiveX.